Players, the wait is over, and the wait was well worth it. 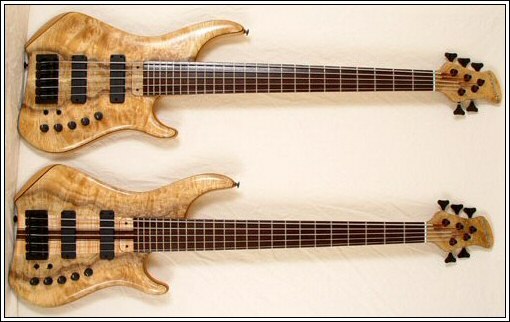 Pete Hanewinckel’s first 2 basses for LAG have arrived and they are a matched set of twins. Everything is the same, except one is bolt-on, one is neck-thru. This will be interesting. 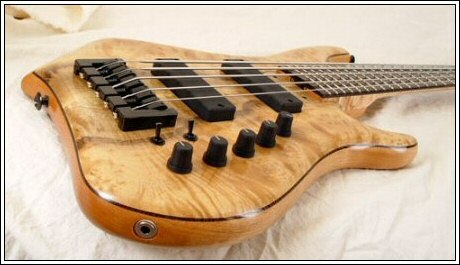 To the basses; both are Signature models, Reactor body style, with Alder bodies, beautifully figured tops, headstock veneers ( front and rear ), and control cavity covers of Myrtle wood. The finish is hand rubbed oil, a minimum of 9 coats. 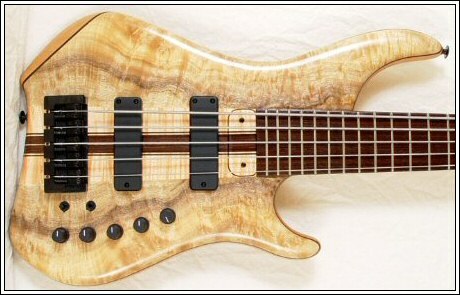 This really enhances the beauty of the wood. 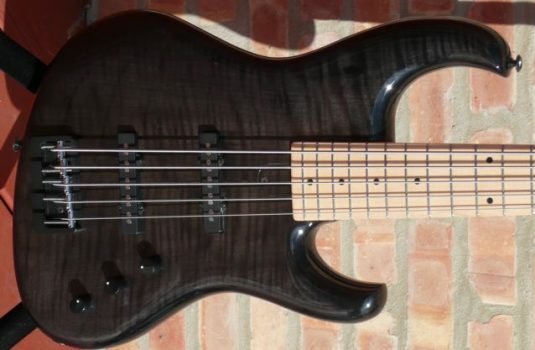 The 35″ scale nine piece necks are upgraded Birdseye Maple and Wenge with Wenge fingerboards. 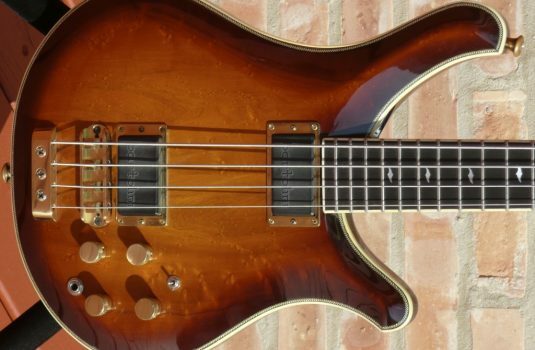 The electronics are Pete’s favorite Bartolini soapbars with a Bart 18V NS2TMB 3 band EQ featuring a 3 position mid frequency selector switch and series switch. 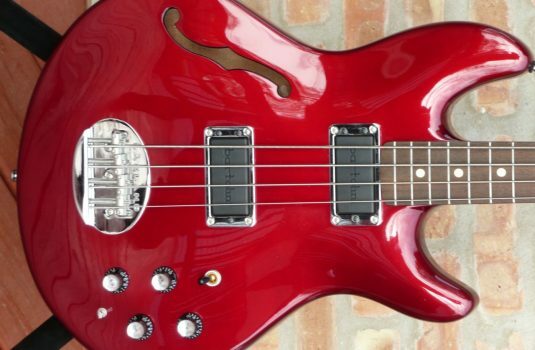 4 magnet pickups into a PBass configuration, shutting off a pair diagonally opposing pickups. 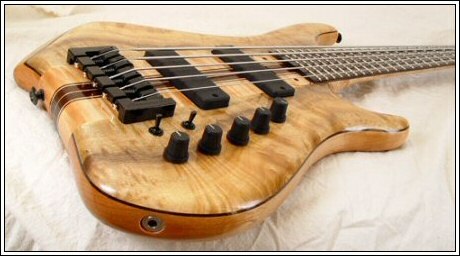 Great tone and variety of tones on these basses. The string spacing is 3/4 at the bridge (Pete also offers a slightly narrower 11/16 as an option). The hardware is black, with Gotoh tuners and Pete’s own custom machined brass bridge. All Hanewinckel basses are supplied with a nicely padded gig bag, leather strap and tool kit. 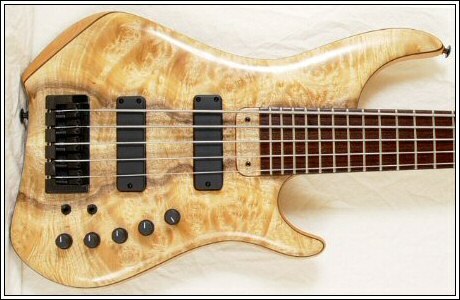 We are please and proud to offer you players these fine basses from a very talented builder, Pete Hanewinckel. Pete, we thrilled to be able to work with you.